So-called “conversion therapy” is nothing more than a remnant of our nation’s shameful history of oppression of lesbian, gay, bisexual and transgender people. 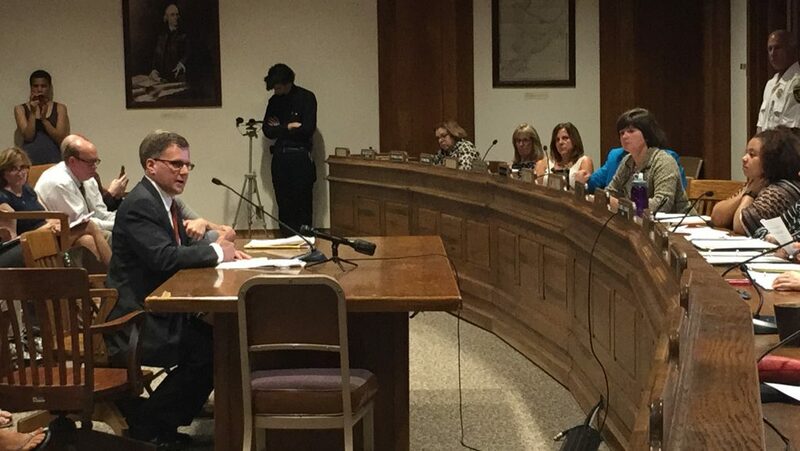 GLAD Senior Staff Attorney Ben Klein presented testimony July 28 before the MA Legislature’s Joint Committee on Children, Families and Persons with Disabilities in support of An Act Relative to Abusive Practices to Change Sexual Orientation or Gender Identity in Minors. There is a consensus among the medical and mental health professionals, including the American Psychological Association and the American Medical Association, that [so-called “conversion therapy”] is ineffective, unethical and subjects LGBT people to significant harm, including depression, hopelessness, and suicidality. Nobody should ever experience that horror. Both of these important goals are at the heart of a bill sponsored by Massachusetts Representative Kay Khan that would prohibit licensed health care professionals from engaging in the discredited and harmful practice of seeking to change a minor’s sexual orientation or gender identity (“An Act Relative to Abusive Practices to Change Sexual Orientation or Gender Identity in Minors”). The Legislature’s Joint Committee on Children, Families and Persons with Disabilities heard testimony in support of this bill July 28. Similar laws have been passed in California, New Jersey, Oregon, and the District of Columbia. So-called “conversion therapy” is nothing more than a remnant of our nation’s shameful history of oppression of lesbian, gay, bisexual and transgender people. There is a consensus among the medical and mental health professionals, including the American Psychological Association and the American Medical Association, that this practice is ineffective, unethical and subjects LGBT people to significant harm, including depression, hopelessness, and suicidality. Nobody should ever experience that horror. So much bullying and harassment that takes place in our world can be traced to the underlying notion of the abnormality or “otherness” of LGBT people… our society hast yet to eradicate the historical notion that it’s not okay to be lesbian, gay, bisexual or transgender. But there’s another reason that passing this law is so important. We need to face the reality that even in states that have been leaders in legal equality for LGBT people, too many LGBT youth in our society grow up believing that something is “wrong” with them. We may have marriage equality and nondiscrimination laws in New England, but too many adults in our society – if they were really being honest – don’t believe that being lesbian, gay, bisexual or transgender is just as normal and healthy as being heterosexual or cisgender. So much bullying and harassment that takes place in our world can be traced to the underlying notion of the abnormality or “otherness” of LGBT people. Too many LGBT youth devalue themselves, and are devalued by others, because our society hast yet to eradicate the historical notion that it’s not okay to be lesbian, gay, bisexual or transgender. Passage of the ban on conversion therapy will send a powerful and important message to all people: the state declares that there is nothing about one’s sexual orientation or gender identity that needs to be changed because being lesbian, gay, bisexual, or transgender is normal and healthy. My colleagues at the National Center for Lesbian Rights in San Francisco said it best in naming their campaign to end conversion therapy, #BornPerfect. As LGBT people, we are all born perfect. And, yes, we still live in a world in which it is important for the government to say so. Learn more about An Act Relative to Abusive Practices to Change Sexual Orientation or Gender Identity in Minors and what you can do to help.